Our service team has at least one thing in common with a good cup of coffee: it’s always there when you need it. We provide you with all the service and support you need to keep pace with the rapidly growing demand for specialty coffee. You will be paired with an experienced Sales Manager and a team of Customer Care Representatives who can respond to (and anticipate) your needs. We offer free installation of our top grade equipment (including brewers and grinders), expert calibration, and extensive trainings. 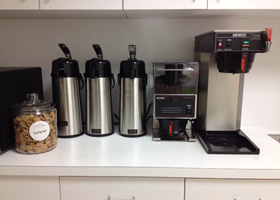 Now you can enjoy Tidewater Coffee Certified Fair Trade Organic coffees in your office! All of our coffees are available, both whole bean and ground, in one-pound bags or five-pound bags. We also offer convenient pre-ground, pre-measured portion paks. Just open one up, fill the filter, and you’re ready to brew. Ask us how to get started! Tidewater Coffee has over 250 restaurants in the Hampton Roads Area that we supply our coffee, tea and specialized national brands to weekly. We supply top breakfast spots, cafes, busy lunchtime diners and many fine dining restaurants. We only sell the best hand crafted coffees and we strive to continue to improve our products for your customers so they will appreciate our superior difference in quality. 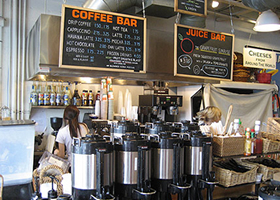 Tidewater Coffee has developed over the years a tested and proven Convenience store coffee program that provides everything you need to create a profitable, fully-branded coffee experience. Each of our levels provides the right mix of product, merchandizing, and marketing support you need to succeed, based on coffee sales volume. 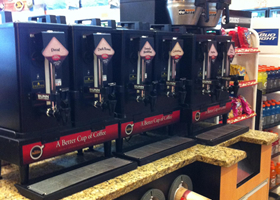 You can turn your convenience store into a destination coffee stop by serving exceptional Tidewater Coffee. Many travelers complain about the awful tasting “tea-bag” coffee in their hotel rooms. 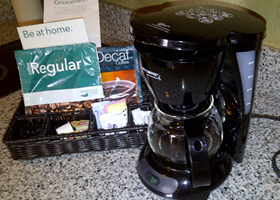 Tidewater Coffee has been a major hotel provider of gourmet coffee for many years. We can supply your hotel, motel, lodge, or bed and breakfast with individually packed pre-ground coffees for any size, in-room, coffee maker. Give your guests wonderful, fresh organic coffee to begin the day. We’re here to help!